Fraternal twin brothers Peter and Kyle go on a quest to find the father they never knew when Peter discovers the man he thought was their deceased dad is neither dead nor their father. 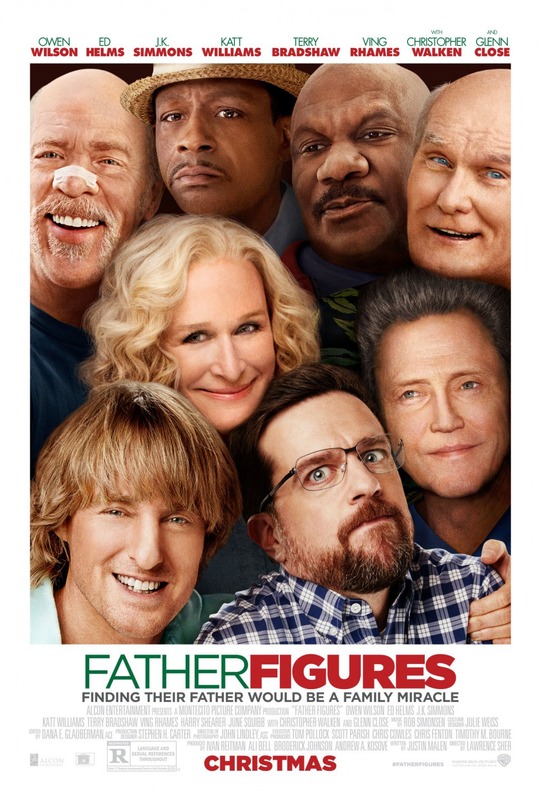 Is it just us, or does "Father Figures" feel like it should be called, "It's So Painfully Obvious This Was a Contractual Obligation?" Why do we do this to ourselves? "Father Figures" is the directorial debut of Lawrence Sher, who up until this point has worked as a cinematographer on films like "The Hangover," "Dan in Real Life," and "War Dogs." It is written by Justin Malen, who wrote the comedy "Office Christmas Party." It stars Ed Helms and Owen Wilson as fraternal twin brothers Peter and Kyle Reynolds. Joining them is Glenn Close, who plays their mother Helen. Also in the film in much smaller capacities are Terry Bradshaw, Ving Rhames, J.K. Simmons, Harry Shearer, Katt Williams, Jack McGee, and Christopher Walken. While attending their mother's wedding, Peter sees the man he thought was his dead father in an episode of "Law & Order." When he confronts his mom, she tells Peter and Kyle she has been lying about who their father was because she doesn't really know who he was...though it could be Terry Bradshaw. The two brothers then embark on a road trip to find their father. We wish we could say hilarity ensues but it doesn't. "Father Figures" is a movie with many well-known actors, several of whom are Oscar nominees and two of whom are Oscar winners. When we see a film like this, one with such poor, borderline nonexistent marketing and a movie poster that looks like it was put together by someone using photoshop for the first time, it screams "this was a favor for a friend," or "this was a contractual obligation to a studio." The movie was supposed to come out in November 2016 but was pushed back multiple times. Now we know why. Nobody involved in this movie seems to be giving it even the slightest bit of effort. The chemistry between characters is nil. The movie is not funny. The subject has been explored so many times in the past that there's nothing new this project could possibly bring to the table. Just about every joke falls flat with the exception of one or two. It wastes the talents of Glenn Close and J.K. Simmons and turns them into mockeries of their actual selves. It is poorly paced and is about 30 minutes too long. It's simultaneously too ridiculous and not ridiculous enough. The studio clearly had no faith in "Father Figures." It seems like they finally decided to dump it in December and hoped some people looking to go to "Star Wars: The Last Jedi" of "Jumanji: Welcome to the Jungle" over their Christmas vacation would find their showtimes sold out so they would be forced to look for another option and watch this trash-fire instead. To tell you fine readers the truth, this was the last December release we wanted to see, so we delayed watching it until we absolutely *had to* see it. There were five people in our theater including us, and three of them walked out. That's right, every other person who was not obligated to finish "Father Figures" as part of their job left the theater before it was over. This may be just fine and dandy because, by the time the credits rolled, the only fact we learned about any of the characters in this movie is that Glenn Close's Helen is a chronic and habitual liar. The one positive thing about this movie is it didn't make us hate ourselves too terribly much when it was over, but it's still an unfunny slog not is worth your time or effort.